16th Magh is commemorated as Martyrs day in our country. It is the day when enthusiastic youths were killed for democracy by the autocratic Rana ruler. The commemoration of the martyrs continues for a week in Kathmandu. People pay homage to the martyrs all over the Nepal. In Kathmandu ministers, government officers, political leaders, and even ordinary citizens go to the Martyrs gate at Tundhikhel and offer garlands and bouquets to the busts of martyrs in honor of their contributions to democracy. They also visit Teku- pachali where Shukraraj Shastri was hanged, Siphal where Dharmabhakta was executed and Shobhagawati where Dasrath Chand and Gangalal were shot dead. Similarly, Sahid Smarak (Martyrs Memorial) at Lainchaur is the place where martyrs are honored by offering flowers, etc. Likewise, we also pay tribute to known martyrs who sacrifice their lives during the movement of 2062/63 BS, and Madesh Movement as well as the Maoist Peoples' Wars. 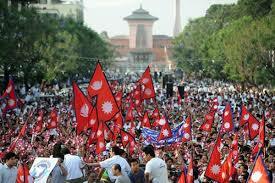 7th Falgun is the democracy Day in Nepal. On that day in 2007 B.S. Rana rule was overthrown and democracy was established in the country. Every year we celebrate democracy day, on this occasion, there is a public holiday. People take out a procession in every town and leaders address meetings in order to raise awareness. Different kinds of programs are launched. On 14 September 1990, (29 Bhadra), Nepal signed the International Convention on the Rights of the child 1989. We observe this day as Children's day. 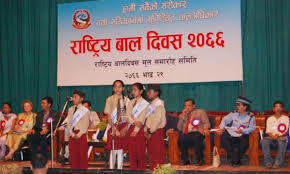 On this day, various programs are organized in schools and Bal Mandirs. Children are given sweets, fruits, and clothes. Speeches are made to make people aware of child rights. The constitution day is the day on which the constitution of the country is announced. After the Peoples Movement II, the old constitution the Constitution of the Kingdom of Nepal 2047 B.S. was annulled and the Interim Constitution of Nepal 2063 BS was promulgated on 1st Magh. Thus, 1st Magh is our Constitution Day and we celebrate this day annually. Baisakh 11 is a red-letter day in the history of Nepal. On this day in 2063 B.S. King Gyanendra had to yield to the 1 day long People's Movement II. He had to return the state power and sovereignty to the citizens of Nepal. This day is celebrated as Loktranta Day in the country. Education day used to be celebrated on Falgun 12 but from 2063 BS it is celebrated on September 8, which is the World literacy Day. On this day, people and institutions that have rendered valuable services to the cause of education are honored and awarded for a special program. In addition to this, medals and certificates of honor are awarded to those who have done Ph.D. or topped in Masters and Bachelors levels. These schools whose SLC results are best in the country or district are awarded education shields. We celebrate International Women's day on March 8 every year to commemorate to the struggle made for the equal rights with men. Women in government service are given holiday. They organize programs to arouse awareness in women. Men and women are equal in the eye of law and both of them should be equal in society as well. The particular days in which great changes, events, or declarations have been made for the welfare of people, community or country is known as National day. Martyr's Day - celebrated on 16th Magh, every year. Democracy Day- celebrated on 7th Falgun, every year. children's Day- celebrated on 29th Bhadra, every year. Constitution Day- celebrated on 1st Magh, every year. Loktantra Day- celebrated on 11th Baisakh, every year. Education Day- celebrated on 8th September, every year. International Women's Day- celebrated on 8th March, every year. Ganatantra Day- celebrated on 15th Jestha, every year. Labor Day- celebrated on 1st May, every year. There is no consensus regarding celebration of National Days. Some people emphasize on celebration while others consider as a misuse of time. In your opinion, is it appropriate or not to celebrate National Days? Mention in four points. There is no consensus regarding celebration of national days. Some people emphasize on celebration while other consider it as misuse of them. I think, it is very appropriate to celebrate the national days. Celebration of national days pays respect and honor to the contributors for their outstanding performance for the betterment of the nation. They also encourage us to work hard and devote for other without any selfishness and unwanted desire. Celebration of national days strengthens the unity amongst the individuals of a community and empowers them to seek their roles and responsibility for national integrity and development. To remember the contributors for their principles, convictions and sacrifice for others welfare and development and propriety. "Celebration of Martyrs' Day is duly a respect to the martyrs." Write your opinion to the statement in four points. A person who suffers death for a cause of benefiting the nation and its people is known as martyr. 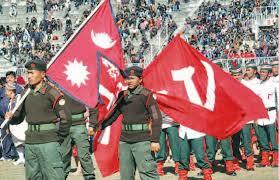 Nepal celebrates Martyrs' Day on 16th Magh every year. By offering bunch of flowers to the statue of the martyrs and conducting various programmes to memories their contribution, this day is celebrated at different levels. The Government of Nepal also announces public holiday on the date and encourages all to participate in the programmes organized on the occasion. Organizing various activities to respect and honour the outstanding contribution made by the martyrs for the betterment of the country encourages all to prepare themselves for sacrifice and devotion. Hard work and feeling of patriotism can be learnt from the martyrs. The principles and convictions adopted by the martyrs readily empower the conduct of general people to the leaders. That instantly means they are all time memorable or the people and nation. 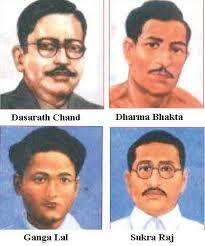 Considering all the tributes paid by the state to the martyrs has significantly uplifted their importance at present. This also shares greater responsibility with the people in the days to come. So, it is a due respect for the martyrs to celebrate the Martyrs' Day on Magh 16th every year in Nepal. Every year 14th September (Bhadra 29) is celebrated as a Children's Day. How should it be observed? Write your opinion in four points. Organizing various competitions such as elocution, drawing, sports, etc. in different parts of the country and awarding the prizes to the best. Launching rally, demonstration, etc. highlighting the importance of the child rights. Visiting different orphanage and organization that take care of physically challenged children and providing necessary help to them. Organizing awareness programmes about the norms and values of the UN Child Rights and ways of implementing them. Are you satisfied with the way the National Days are celebrated or would you suggest some changes? Write a letter to the editor of Gorkhapatra giving some suggestions. I would like to put forward a few suggestions for the celebration of national days. We have a tradition of giving holiday on national days. But how does it help in giving the importance of the day? People rejoice on the holiday but do not feel the importance of the day. So, instead of giving holidays on national days, we can conduct several programmes revealing the specialty of the day and make people feel its importance. National days are not celebrated the way they are supposed to be. So I like to request you to emphasize on this topic in your paper Gorkhapatra and publish my views. Write any four national days of our country and explain any two of them in short. Martyrs' day, Democracy Day, Women's day and Children's day are four national days of our country. Democracy day: The 7th Falgun 2007 BS was the day when the Rana regime was overthrown and democratic government, under the leadership of king Tribhuvan was established in the country. On this day, a mass procession of the political leaders, high government officials and the general people is held by the prime minister along the main roads of Kathmandu and a mass meeting is held at Tudhikhel. All offices, schools and colleges are closed on this day so that everyone can celebrate this important national festival. 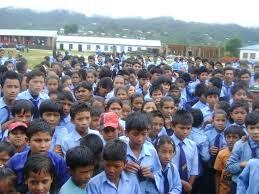 Children's day: Children's day falls on 4th Bhadra every year. It marks the birth anniversary of queen mother Ratna Rajya Laxmi. School children participate in procession and programme held especially at Balmanirs. There is special celebration at central Balmandir in Naxal, Kathmandu. The organizers organize contest like on the spot painting, oratory, essay writing and different games. Why do we celebrate Martyrs' Day? We celebrate Martyrs' Day on 16th Magh to commemorate the sacrifice of different martyrs who fought the Rana regime and also to emulate the path that they have shown to the nation. In present context, which of the national days need to be observed in Nepal? Why? Write some reasons. National days are those days of such significant values celebrated on the commemoration of past glories of events or greatness of national figure. There are many such national days but in my opinion any one such important days to be importantly celebrated is Democracy Day. Nepal got an end of 104 years old of despotic Rana rule in 2007, Falgun 7. It was a period of darkness caused by injustice, exploitation, family luxury, feudalism, ignoring people's rights, etc. the struggle against the Ranarchy throughout the country along with the martyrdom of great heroes, armed movement and people's revolt ultimately made the Rana rule come to end. This is a great day. It taught people should themselves fight for their rights and freedom. Loktantra day is celebrated on 11th Baisakh. Suppose you have been given the responsibility to manage and conduct the programme on that day, what would be your programme and how would you manage and conduct it? According to the meeting we planned to organize an oratory competition on the topic 'Need of Promoting Loktantra for which we formed a committee. We drafted a letter of invitation as a chief guest to the local resident, a renowned political leader, to attend the programme. A group of artists were activated to perform a short street drama on the subject of Loktantra and its promotion. School volunteers were mobilized to do their respective job with preparing sound system, chairs and benches, stage preparation, etc. On the very day of programme, with the programme list, it was started. It started with my welcome speech, seating invitation of the guests, batch distribution, speech of the guests, programme chairperson etc. At last, artists group performed the drama which was grandly held, great appreciation was received, and the tea and biscuits were served to the attendants. It has been started to celebrate Children's day on 29th Bhadra from 2063 BS. But nowadays, it is celebrated is traditional style. What should be done to change the style of children's day celebration? Give your views in four points. The UN rights norms and values and the Children's Right passed from Nepal parliament should be strongly observed to practically implement it and they should act in an inspirational way to celebrate the day. At least, a childrens' well managed house should be built in every districts or religion centers for the orphans, physically incapable rather than speech programmes organizing as formality. Making a procession of all types of able, incapable, lame orphans children and giving moral pressure to the leaders and law makers to think and act for them. To give away prizes to the qualified children in various sectors, giving them honor in almost every district through any formal programmes. In a program organized on the occasion of Children's Day, an intellectual person said, 'children can utilize their rights till all children feel secure in nation'. Present your views with any four logics to support the statement. It's because of the condition of chaos, disorder and lack of security that can't think for struggle to use their rights. When they feel unsecured, they don't find favourable atmosphere to broader their mad or take knowledge. Because of insecurity can't bring out their interest to learn anything, see anything or enrich by external factors. In lack of security, children are deprived of participatory approach of learning. 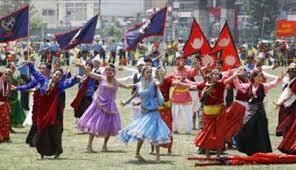 Which dance continues from Gaijatra to Indrajatra in the Kathmandu valley? When do we observe Loktantra Day? Which national day do we celebrate on 8th september? When do we celebrate Martyr's Day? When do we celebrate Children's Day? When do we celebrate International Women's Day? When do we celebrate Democracy Day? When do we celebrate International Labour Day? Any Questions on 'Our National Days '?